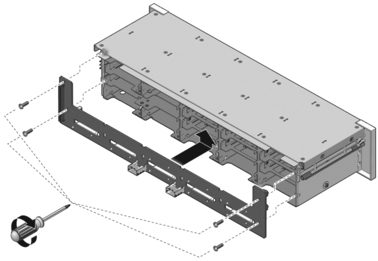 Slide the backplane under the retention hooks on the hard drive cage. Install the No. 1 Phillips screws that secure the backplane to the hard drive cage. Two screws secure the backplane in the Sun SPARC Enterprise T5120 server. See the first figure below. Four screws secure the backplane in the Sun SPARC Enterprise T5220 server. See the second figure below. Install the hard drive cage. 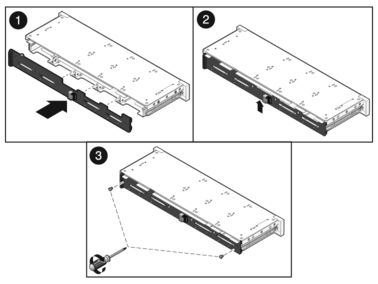 See Install the Hard Drive Cage.